Sunday dawned bright and early at 6:00am when Jenny and Dan knocked on the front door, bringing Simmons Olympics HQ to near-bursting. Comatose, having gotten home after midnight the night before, I started muttering”Is someone knocking?” and then in true sisterly fashion failed to get up and actually open the door. Luckily my dad was up to let her in, considering she’d left Bellingham at 5:00am and drove right up to the border (all lanes open. At 5:30am. Our tax dollars hard at work.). 20 minutes after Jenny arrived (and then promptly left the house in favor of SITTING IN HER CAR. No one ever said Simmons Olympics HQ was welcoming) my dad tried to set the home on fire by incinerating his toast (let’s just say we were hoping the Brinks security system didn’t automatically call the fire department, as we frantically swung the door open and closed while an ear-splittle whistle shattered the 6:30am peace). Realizing I was going to get no more sleep, I got showered and escaped to Starbucks prior to leaving to the luge. We had to buy bus tickets to take the Oly bus up to Whistler, and when we got to the ticket station (inexplicably NOWHERE near where you get on the bus) one of the five volunteers that were standing around helpfully mentioned that “the last bus” was supposed to leave at 9:30am (current time: 9:53am) and he was going to have to call and see if there was still a bus around to take us. As he radioed up to where you actually pick up the bus, we stuck our credit card into the super helpful bus ticket buying kiosk, which, prepare yourself for a brilliant idea, only let you buy one ticket per credit card swipe. Time-wasting at its best!). We then RAN, literally RAN up a giant hill to catch the bus and made it just in time. Wet and disgruntled, we arrive at Luge. I took the opportunity to nap on the 2 hour bus ride to Whistler which made the trip go by VERY fast. 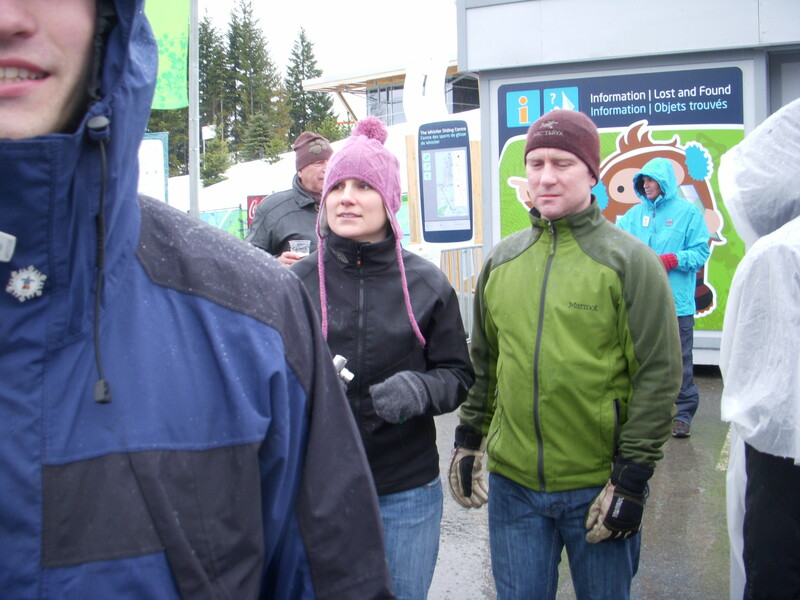 Once there, we went straight to the luge track, marking the only time I’ve been to Whistler without seeing the village. I was a little doubtful of luge- first, someone DIED there a mere 2 days prior. Second, it didn’t seem like a good spectator sport. These guys are moving at over 140km/h at the end of the track. My head does not spin that fast. Plus when we got there it was a total deluge, even on the mountain. Just pouring rain. So we went to the warming hut for a few minutes and the rain lessened before we headed up to the track. We found an awesome spot at turn 14, where they’re going plus 120kmh, and immediately started a competition as to who could snap a picture of a luger first (Bill). Then the sun came out and we wandered around and found different spots along the course and finally settled for awhile on a spot AFTER the finish, where they were braking. Which allowed us to get pictures, wave, throw pennies on the track (kidding about the pennies, but it did make me nervous how easily a child or evil adult could chuck something on the course…). Bill had to keep elbowing some guy out of the way who spent the entire time talking on his cellphone and smoking. Dear sir, please go ruin someone else’s Olympic experience (side note: we saw the same guy walking down Robson the next day. In a city with millions of people we saw the same irritating guy. Amazing.). Good thing Dan stuck his Flip Video into my shot. See? Lugers. Close. I kept waving my Oly mittens in their faces. After luge we saw Bill’s mum for a few minutes and then caught the bus back to Vancouver as Bill and I were meeting up with a group of friends from my days at SonShip. In a true nod to my “worst guest ever” status, we were approximately 3 hours late getting there. This time on the bus ride home, I was lucky enough to be treated to a Cultural Olympiad video that was on a loop. Curious how long the video was? 15 minutes. The bus ride was over 2 hours. You do the math. Percentage of people who wanted to kill themselves when they got off the bus? 100.